Editor-in chief: Dr. Eberhard Jänsch, Projectmanager: Willy Waßmuth The RTR Special: Maintenance & Renewal – 22 renowned authors from academia, operators and the industry present in 16 articles innovative machinery, techniques and technologies for maintenance and renewal of the railway infrastructure. The track is the indispensable foundation for the railway system. It has to carry the load of the trains passing over it safely and durably. As every engineer quickly comes to realise, the dynamic strain on the complex vehicle-track interrelationship inevitably results directly in wear and tear. Consequently, the track unavoidably needs periodic maintenance work. What work needs to be done, and how it can be done to maximise economic effi ciency – these are the issues addressed in the new RTR Special: Maintenance & Renewal. Alongside maintenance in the narrow sense of the term, there is also the work of renewal, i.e. larger-scale track reconstruction. This issue too is reported on in the new RTR Special. 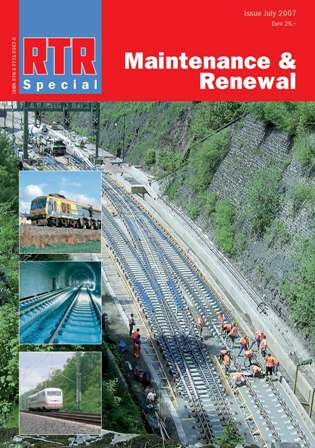 The evolution of track maintenance and renewal technology is itself a highly dynamic process, driven to an exceptional degree by the forces of innovation – see for yourself in the up-to-date and in-depth RTR Special: Maintenance & Renewal.